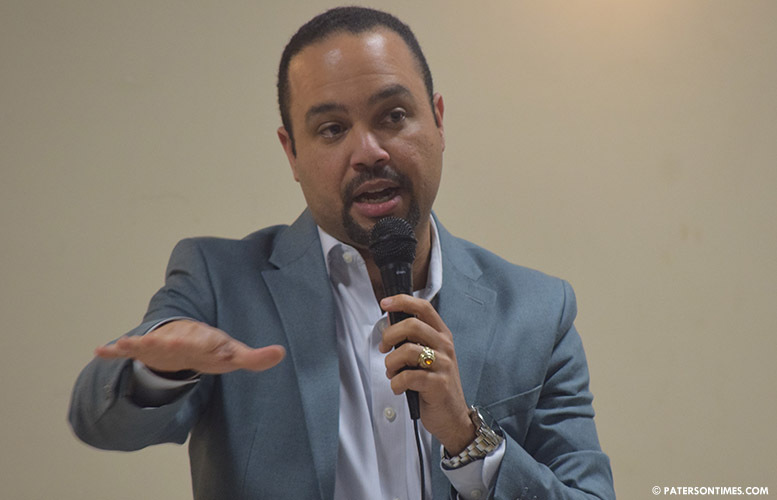 Former school board member Pedro Rodriguez’s detractors have put out a 12-minute audio recording which is being cited as evidence of the alleged tour of the police camera room he denies giving to a member of prominent developer Charles Florio’s organization. In the recording, Rodriguez, who is running for mayor, is heard speaking to another man. He talks about the corruption case against former mayor Jose “Joey” Torres and an alleged kickback scheme having to do with the emergency call center upgrade project. Towards the end of the recording, Rodriguez is speaking of cameras. Both men appear to be looking at footage. At one point, Rodriguez mentions Governor and Carroll Streets and someone threw an egg at a camera. “There’s no tour,” said Rodriguez when asked about the recording on Friday. He is speaking about the 9/11 emergency call center project in the recording, he said. Councilman Andre Sayegh and his ally Florio are attempting to “confuse” people with a “false” audio recording, he said. Sayegh didn’t know anything about a recording. The recording is from Feb. 2017, according to Rodriguez. Rodriguez said the audio was recorded without his permission. He said the recording is of a time when he was providing video footage requested by the other party through an open records request. “The reason why he’s there is for an OPRA,” said Rodriguez referring to the Open Public Records Act. He is heard in the recording instructing the other man on how to play the video. He identified the other man as Florio’s brother-in-law. He suggested the audio recording is a demonstration of how far Sayegh and Florio will go to ensnare him. “He’s trying to get me to say something. But, everything I said, is consistent what I’m saying publicly,” said Rodriguez. In the recording, he tells the other party, he does not take money from anyone. Nowhere in the recording is he pitching or making a camera sale, said Rodriguez. Both men in the recording seem extremely friendly. Both are speaking openly to each other. “Who fills out an OPRA request and gets a personal tour of the police station?” asked Florio. Rodriguez did not respond when asked whether it is typical for him to provide videos to requesters directly. Records requests are usually satisfied by the City Clerk’s Office. Florio has filed a lawsuit against Rodriguez and his wife Graciela Rodriguez. His lawsuit also names Ramon Joaquin and his wife Evelin Rosario. Rodriguez and Joaquin both work at the Paterson Police Department. Both men handle cameras at the department. Both men are accused of running a shell company called Shark Eyes Security under the names of their wives. Joaquin sold a $40,450 security camera system to Florio’s company allegedly promising the cameras would be tied into the Eyes on Paterson, a police surveillance system. Anyone is allowed to tie their private cameras into the Eyes on Paterson system. 80-percent of the cameras Florio purchased were not tied to the police system, according to the lawsuit filed earlier in the month. He is seeking damages. Rodriguez and Joaquin are both accused of using their official positions to drum up business for their private camera company. “They knew it was wrong, so they put it under their wives’ names,” said Florio. Rodriguez has denied the allegations in the lawsuit. He has called it “frivolous” and vowed to file a counter lawsuit against Florio for defamation of character. Florio has said the lawsuit was filed after Rodriguez criticized him in mayoral debates. Rodriguez has railed against outside developers. Florio has contributed to councilmen Sayegh and William McKoy’s campaigns. Rodriguez shares his office with police detectives. He said the camera was handed over to Internal Affairs which sent it to the Passaic County Prosecutor’s Office for an investigation. Florio is going all out to clear the path for his boy Andre. All morons if you ask me. Leaving Sayegh to slide right in as Mayor, although McCoy could slide in. You know the people are fed up and they know Pedro was Joey's right hand man. To bad Pedro and Mendez are to stupid to realize this.